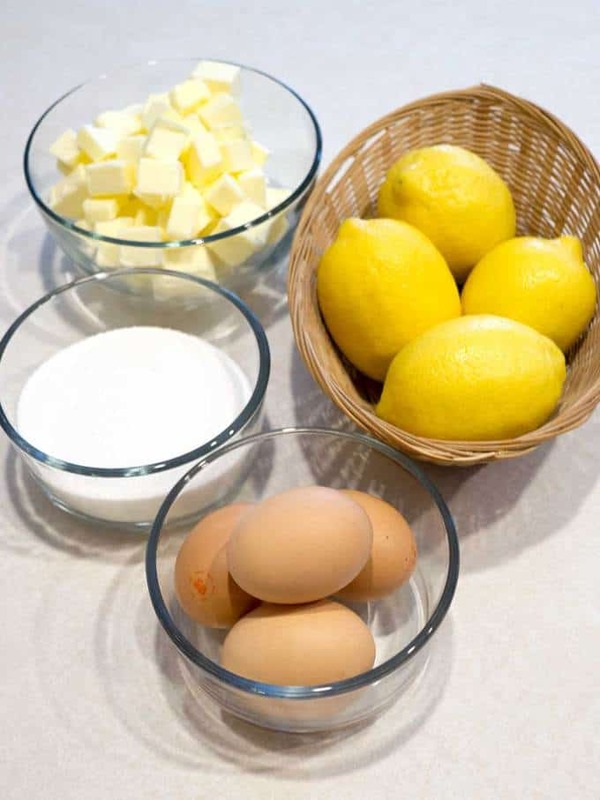 Borrowing from Dori Greenspan, I used the following ingredients for the French Lemon Cream: Sugar, lemons eggs and unsalted butter. The day before I made the lemon cream, I made a pâte sucrée dough and refrigerated it. The next day, I separated the dough in half, and placed a half on a floured piece of parchment paper. Because the dough was cold, I hit it a few times with my rolling pin to begin to soften it. I rolled it into a rough circle that was about 12-inches in diameter and 1/4-inch thick. Then, I rolled the pastry around the rolling pin and carefully placed it in my 9-inch tart pan with a removable bottom. 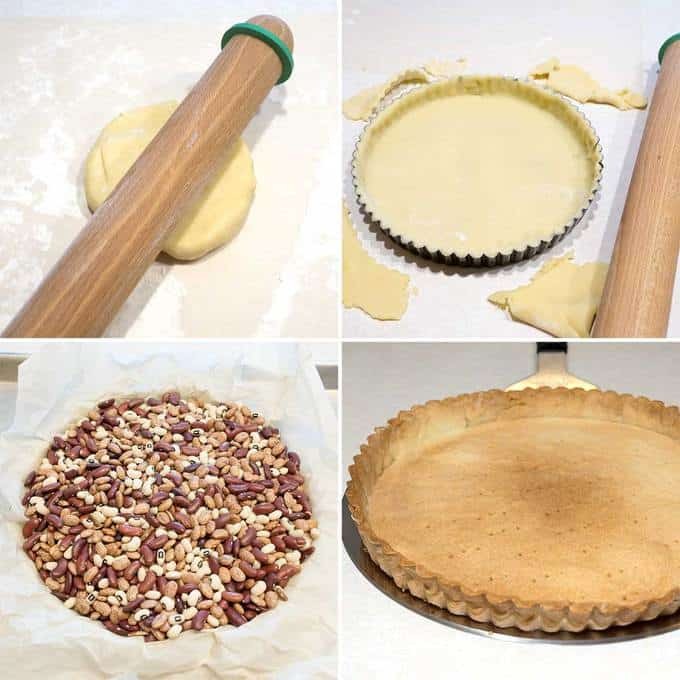 Next, I rolled the rolling pin over the top edges of the tart pan to cut the excess dough, and pierced the bottom a number of times with the tins of a fork. Finally, I refrigerated the tart dough for about an hour. Before I was ready to bake it, I took a piece of parchment paper, crumpled it, and placed it on top of the tart dough. Then, I completely filled the tart pan with dried beans. I baked the tart shell until it was golden brown, half way through removing the parchment paper and beans, and allowed it to cool to room temperature. I started by grating the zest from three lemons, and adding the zest to the sugar which was in a large heatproof bowl. Next, I rubbed the sugar and zest together between my fingers until the sugar was moist, grainy, and very aromatic. Finally, I squeezed the juice from the lemons. I whisked the eggs into the sugar and lemon zest, and added the the lemon juice. Then, I placed the bowl over a saucepan of simmering water making sure that the bowl did not touch the water. As soon as the mixture felt a bit warm, I began whisking it until it reached 180° F on my instant read thermometer. When it reached 180° F, I removed the lemon cream from the heat and strained it into the container of my blender. I let the lemon cream stand for about 10 minutes until it cooled to 140° F. Then, I turned the blender on to high and added the butter, 5 pieces at a time. Once all of the butter had been added, I kept the blender on high for another 3 minutes. 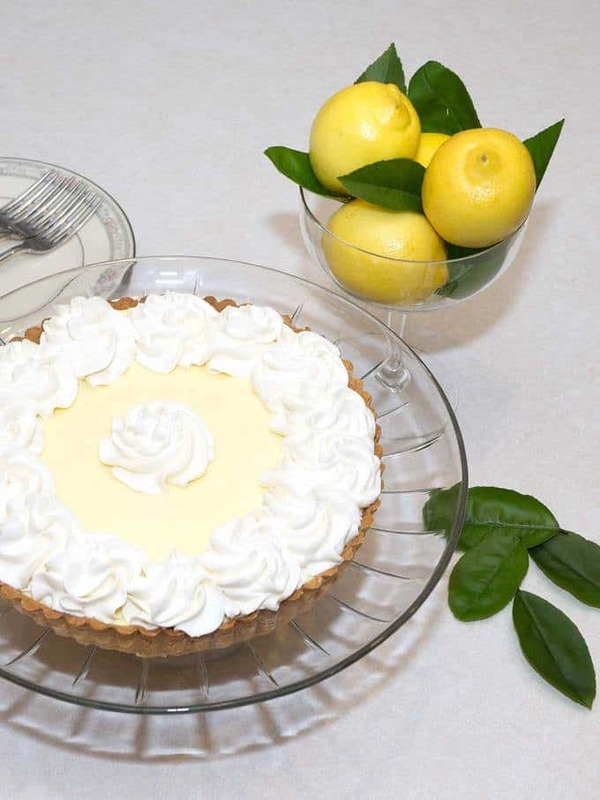 During this time the cream took on a light and airy texture. I poured the lemon cream into a non-reactive bowl, and pressed a piece of plastic wrap against the surface to create an airtight seal. Finally, I refrigerated it for about 4 hours. 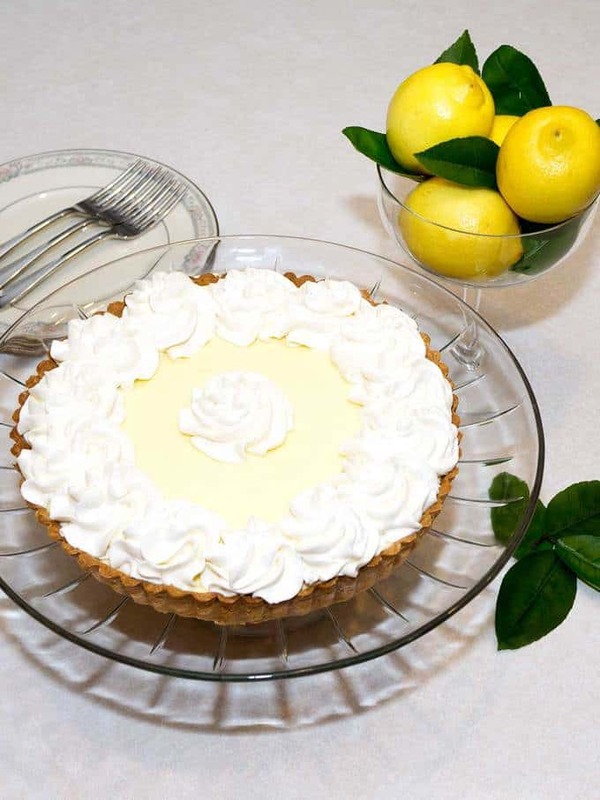 When it was time to assemble the French Lemon Cream Tart, I removed the lemon cream from the refrigerator. Then, I whisked it to ensure that it was smooth, and added it the cooked tart shell. Using a small offset spatula, I smoothed out the top. Now was Susan’s turn to pipe stabilized whipped cream onto the top of the tart. She did this using a large star tip. The result? We ended up with a perfectly delicious French Lemon Cream Tart. Yum! Have an instant-read thermometer, a strainer, and a blender at hand. Bring a few inches of water to a simmer in a large saucepan. Put the sugar and lemon zest in a large heatproof bowl that can be set over the pan of simmering water. Off the heat, rub the sugar and lemon zest together between your fingers until the sugar is moist, grainy, and very aromatic. Whisk in the eggs, followed by the lemon juice. Set the bowl over the saucepan, making sure that it does not touch the water, and start stirring with the whisk as soon as the mixture feels tepid to the touch. 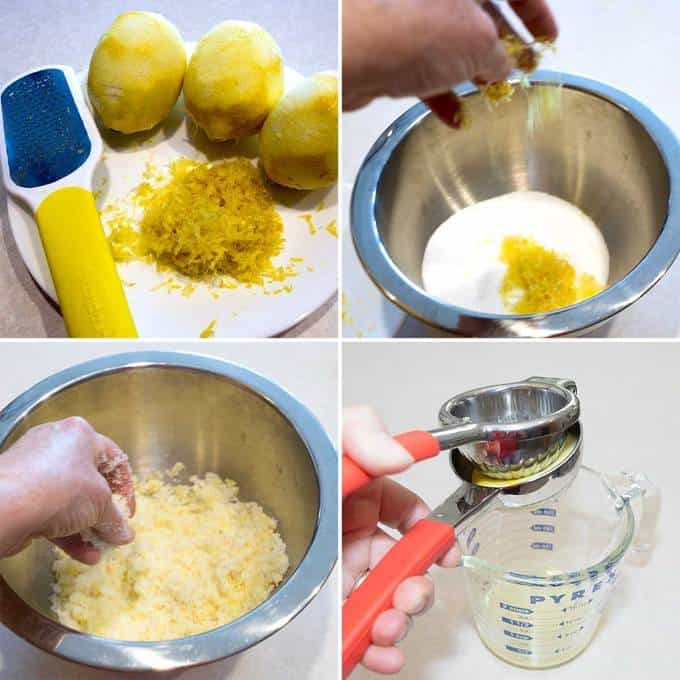 Cook the lemon cream until it reaches 180° F. As you whisk - you must whisk constantly to keep the eggs from scrambling - you'll see that the cream starts out light and foamy, then bubbles will get bigger, and then, as it gets closer to 180° F, it will start to thicken and the whisk will leave tracks. When the whisk leaves tracks, the cream is almost ready. 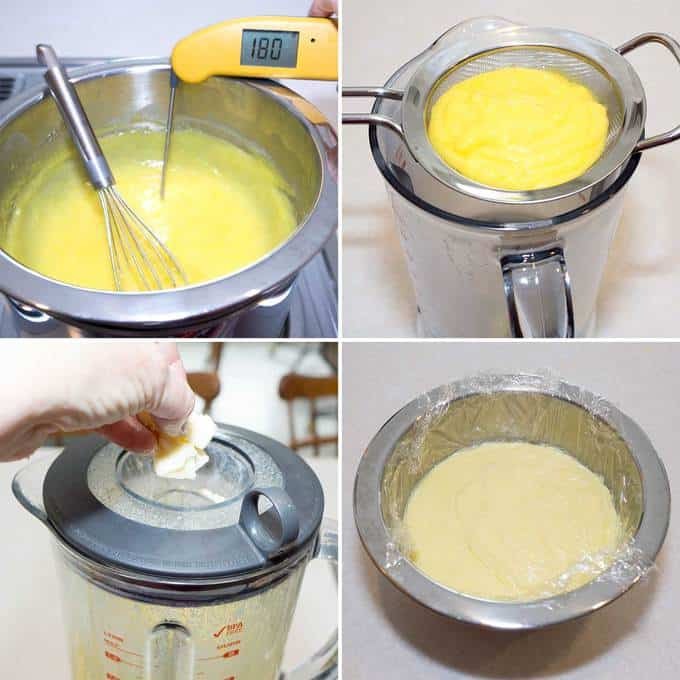 Don't stop whisking or checking the temperature, and have patience - depending on how much heat you're giving the cream, getting to temperature can take as long as 10 minutes. As soon as it reaches 180° F, remove the lemon cream from the heat and strain it into the container of the blender; discard the zest. Let the cream stand, stirring occasionally, until it cools to 140° F, about 10 minutes. Turn the blender to high and, with the machine going, add the butter about 5 pieces at a time. Scrape down the sides of the container as needed as you incorporate the butter. Once the butter is in, keep the machine going - to get the perfect light, airy texture of lemon-cream dreams, you must continue to blend the cream for another 3 minutes. 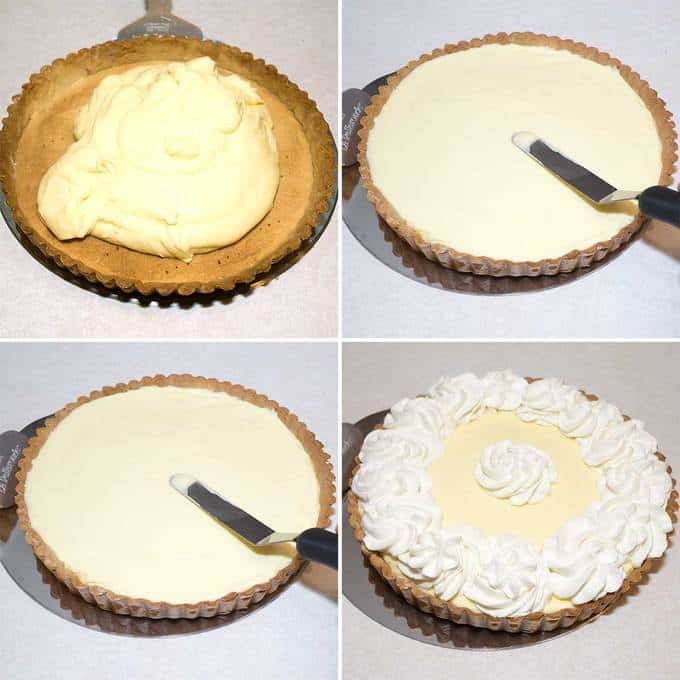 When your ready to assemble the tart, just whisk the cream to loosen it and spoon it into the tart shell. Top with stabilized whipped cream. Serve the tart, or refrigerate until needed. Yield: 1 9-inch French Lemon Cream Tart.